The tabebuia argentina and the jacaranda are almost done…the carpets of yellow/purple are almost over. Now it is the turn of the Gul Mohar and the Copper-Shield Bearers to carpet the roads with red/yellow. Summer comes with some delights…all of them juicy. Cucumbers, mangoes, pineapples, watermelons…all these are cut, andsometimes eaten as they are, and sometimes eaten with salt and chilli powder smeared on them. I was passing by M N Rao Park in Basavanagudi, one of the localities of Bangalore which still retains its old-world grace and charm, and I saw a lovely sight, a push-cart with cucumbers piled high. The vendors sense of aesthetics had made him tuck roses in here and there and the result was very visually appealing! 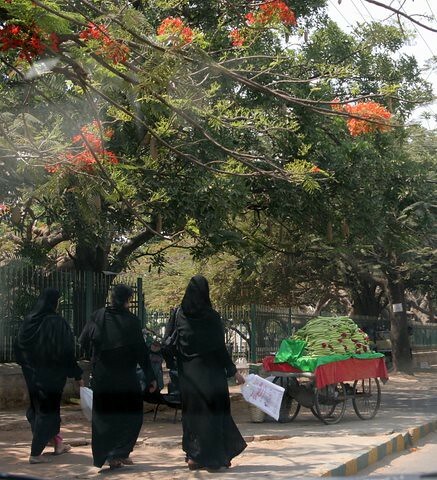 So I decided I would click the push-cart, as well as the Gul Mohar blooms beginning on the tree above. Just as I aimed, these three burqa-clad women came into the frame (two of them have that other ubiquitous item that has pervaded our lives, the Plastic Bag, look at them swinging the bags happily! )…and it was too good to miss!